The immediate benefits of yoga are greater flexibility, strength and better physical health. For example backaches are relieved, you sleep more soundly, digestion is better and your concentration improves. Yoga brings awareness and develops your ability to be still. As you continue with your practice, spiritual and psychological benefits begin to appear. The yoga postures are precise. You will be guided safely through them and helped by Sarah who is trained to make appropriate adjustments to enable you to reach your full potential. You will be introduced to the basic asanas (poses), standing poses, sitting and recuperative poses. All the poses have different effects on the body. 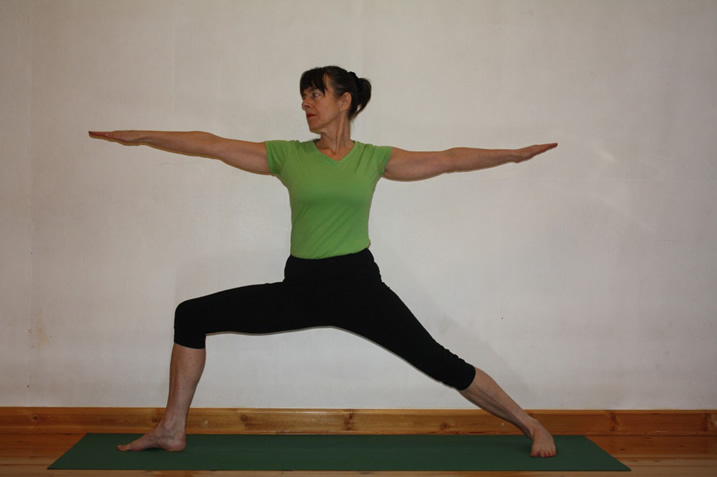 For example the pose above, Warrior 2 opens the chest, tones the legs and hamstrings, strengthens the spinal muscles and instills the courage of a warrior! The postures can involve intense stretching. But you will leave the class feeling lighter and calmer. Copyright 2015 Spirit of Yoga - All Rights Reserved.